Gov. Bill Walker signs House Bill 331 into law along with Revenue Commissioner Sheldon Fisher and Reps. Jason Grenn (left) and Adam Wool (Right) on June 20, 2018. FAIRBANKS–With a lawsuit already filed against House Bill 331, Gov. Bill Walker signed the legislation allowing the state to borrow up to $1 billion to pay off tax credits owed to oil and gas companies at a discounted rate into law on Wednesday. Gov. 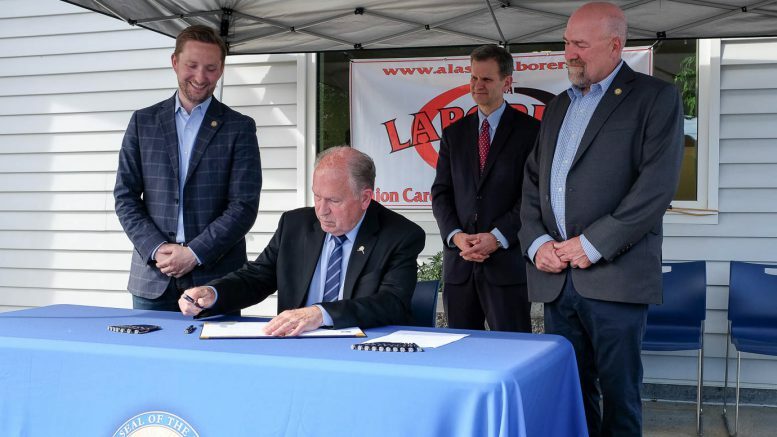 Bill Walker signed the legislation outside the Fairbanks Laborers’ Local 942 hall, flanked by Revenue Commissioner Sheldon Fisher, Fairbanks Rep. Adam Wool and Anchorage Rep. Jason Grenn, who was one of the key supporters of the legislation in the House. “This was the year to get that cleaned up,” Walker said. The lingering oil tax credit tab, which totals about $807 million, has put a burden on the state’s already-troubled financial picture as Walker vetoed earlier payments while the Legislature finally repealed the program. The delayed payments also sidelined many of the smaller oil and gas companies that relied on the tax credits for operational cash flow. Walker said repaying them through this process will allow the state to get on with cleaning up its finances and allow companies to get back to work. “This bill is about putting people back to work,” he said. Fisher said that having the tax credits paid back at a 10 percent discount will cover the cost of bonding the tax credits. The program is designed to lower the annual required payments by the state, but ultimately will extend the duration the tax credits are part of the state’s annual budget as it pays off the bonds. The legislation faced skepticism during the legislative process as many legislators argued that bonding through a bill without the approval of a public vote violated the Alaska Constitution. A legal memo from the Legislature’s legal team agreed that this was a risk, but the state argued that because the bonds aren’t guaranteed by the full faith of the state that it’s constitutional. Two Juneau men, Eric Forrer and Joe Geldhof, have already brought a lawsuit against the state on this matter. Forrer told the Juneau Empire on Wednesday that they plan to take the case to the Alaska Supreme Court, if necessary. There was no mention of the lawsuit that’s hanging over the legislation during the announcement, and Walker declined to discuss the litigation in detail in a short interview after the signing. He did say, however, that he doesn’t believe the bonding will go out until the lawsuit is resolved. Be the first to comment on "With lawsuit looming, Gov. Walker signs oil tax credit bonding bill"